The portrait above is of Elizabeth Farnese, the Italian Queen of Spain and undoubted main-mover of this event. The map is an attempt to show the situation in Italy in the middle of the 18th century. You know my interest in the SYW but recently I have become very interested in the WAS and in particular the Italian Theatre -and I use that latter word in both senses. The rulers and diplomats played with the states of Italy as if they were chips in a large poker game. - I'll bet you a Mantua and raise you a Modena. So this period has exciting and quite unbelievable political machinations. Furthermore, and we are all wargamers here, it has pretty and small armies fused together in strange alliances that shift around. The best study I have found was written by Ian Weir and Red Sash Games and it is produced in a PDF which they have kindly let me reproduce here on my blog. I will serialize this by breaking it down into more manageable parts as it is quite hard to follow the diplomatic waltz that will send many unfortunates to their deaths. I will of course also paint up some of their armies so expect to see Piedmontese, Modenese, Neapolitans, Spaniards and Austrians marching splendidly off to war with some very jazzy flags and uniforms. Lastly, Ian Weir wrote the original PDF in English 'English' but my wretched computer only likes American 'English. So I think, but I'm not 100% sure, it has converted all spellings to US appropriate. I apologize to my Anglo friends for this shocking state of affairs. Email me and I can send you the original PDF. “At this time there is a good opportunity to obtain something for the Infant, Don Philip, and at the same time I beg the King, my nephew, to think of his daughter on this occasion in order that their children may have something to live upon and may not remain cadets.” Philip V of Spain to the King of France, upon the news of the death of the Emperor Charles VI in 1740. Of all the theatres of operation in the War of the Austrian Succession, the Italian is perhaps the most interesting, if not always the most dramatic. The series of campaigns, opening in 1742 and closing in 1748, make the Italian war the longest running of any of the subplots to this conflict. Moreover, while occurring in physical isolation from the rest of Europe, it still had tremendous political repercussions. Fought with armies of, on average, less than 40,000 men a side – often far fewer – the Italian campaigns saw a mixture of masterly inactivity, long marches and countermarches, trial after trial against the Alps, and vicious instants of combat that were, proportionally speaking, the most sanguinary of all the many battles that are incorporated within the War of the Austrian Succession. The fighting here did for the north Italian state of Piedmont-Sardinia what it did for Prussia, though the motivation was different: it turned a middle-ranking power into a dominant one. Like Frederick of Prussia, King Carlos Emmanuel of Sardinia’s decisions were driven by regional geopolitics, but since his lands were at the center of things, rather than on the periphery, best choices were much more difficult to determine. Indeed, because of his success, at not only preserving his state but also expanding it, Charles Emmanuel III has been deemed one of, if not the greatest statesman of his time. Northern Italy, like the Low Countries, has always been a “cockpit” of war. The more so because of its geographic isolation: bounded on three sides by mountains, and on the fourth by the sea. Piedmont, at the rugged western end of the bowl, enjoyed the most favored location, supremely defended by the Alps and the tributaries of the Po. To the north of Piedmont, Swiss neutrality and Swiss arms were a sure protection. With the acquisition, in 1713, of the Duchy of Savoy and the western outlets of the Alpine passes, the mountain kingdom could easily hold her own against France. The latter, in consequence, hoped to keep Piedmont as an ally in order have free access to the plain of Lombardy. To the east and south of Piedmont lay a parcel of small states, some independent rivals, some ruled by the Habsburgs. The Austrians, though a powerful local force, would not dare to move against a state that could, at will, unlock the mountain gates for their hereditary Bourbon foes. ruled by her family for generations, was now under the Habsburg yoke. Parma had been part of the price paid to establish her son, Don Carlos, at Naples, Spain’s one regional gain. But the Kingdom of the Two Sicilies (Sicily and southern Italy) was the most backward and savage of all the Italian lands. Not only that, but Don Carlos felt it would be politic not to place Naples under direct Spanish control, but to rule it independently. [Technically, the name Kingdom of the Two Sicilies applies to the Napoleonic era. In the 18th Century, there were really two kingdoms – Sicily and Naples – that shared a joint heritage, and under Don Carlos, a single ruler (much like Scotland and England). When he later became Carlos VII of Spain, Don Carlos renounced the throne of Naples in favour of his son,and this became standard practice for the family]. called Elisabeth “the Personification of Maternal Blindness, combining Spartan pride, English obstinacy, Italian finesse, and French vanity”. simply a matter of survival. Spain in the 18th Century was the closest thing to a police state that the Age of Enlightenment had. The Russian Court might be a more dangerous place, but at least life there was interesting. In Spain one was not exiled from Court, one was exiled to it. The Court of Spain was a sepulcher. And Elisabeth was Italian. politics, but one or two features stand out. The Spanish began their “reconquista” with the War of the Quadruple Alliance (1718). This saw an unholy union of England and France (and the Emperor) against perceived Spanish aggression. 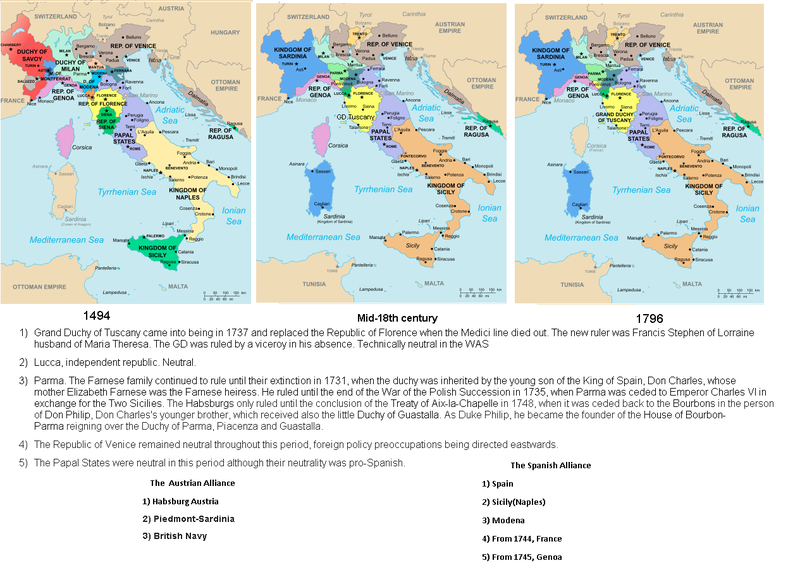 At the peace table, Sicily was awarded to the Emperor; the Duke of Savoy was compensated with Sardinia; Parma and Tuscany were to be held for Don Carlos until he came of age. But the Emperor, Charles VI, insisted Don Carlos hold his lands as an Imperial fief. At first, the Spanish were so angry with the Emperor that during the 1720’s they made a marriage alliance with France out of spite (French policy was, as it had been for a century, still oriented toward the reduction of the House of Habsburg). the Spanish turned once more and became even tighter with the latter. For example, the Spanish recognised the Pragmatic Sanction (the right of the Emperor’s daughter to inherit his possessions). Also, Maria Theresa was promised to Don Carlos. This the British and their allies would not countenance. There was a brief war, with Gibraltar under siege (1727) and Spanish Trade at a standstill, during which it became obvious that the Emperor was not about to help Spain recover The Rock as he had promised, nor to marry his daughter to Don Carlos – the British had bought him off with their own recognition of the Pragmatic Sanction. 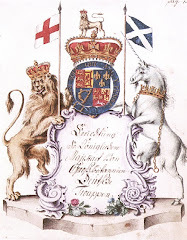 As a sop to Spanish pride, Don Carlos was formally recognized as Duke of Parma (1732), with the right to inherit the Grand Duchy of Tuscany when the current Medici ruler died. Savoy: seek aid from France against Austrian pretensions and aid from Austria against French aggression. ally in the quest to add Milan to Charles Emmanuel’s possessions. With all or even part of the Milanese under Sabaudian rule, Piedmont-Sardinia would have a fine natural frontier on its eastern side. The deal made with Cardinal Fleury of France (Louis’ chief minister) was that in a war with Austria, Charles Emmanuel should receive Milan – and Mantua, if it were also conquered. Furthermore, Charles Emmanuel was to command any combined army in Italy (giving him the greatest amount of control over the course of events). The good Cardinal was ever a double-dealer. 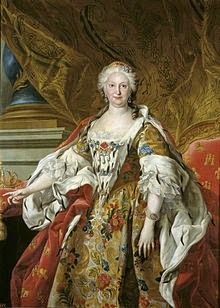 Elisabeth Farnese categorically refused to part with Milan, already promised to Don Carlos. So Fleury made a separate deal, promising Mantua, Parma, Piacenza, the Two Sicilies, and by unstated implication, Milan, to Spain. This was the Treaty of the Escorial, sometimes called the First Family Compact. [Escorial after the palace outside Madrid where the treaty was signed.] The war went well for the Bourbon cause, especially in Italy. had been destined, in the Spanish Queen’s mind, for her son Don Felipe. And she understood that they were intended, in Austrian minds, as a springboard for the conquest of southern Italy. Charles Emmanuel was not satisfied either. He had made a powerful enemy in the Queen of Spain, and received little in compensation. The Austrians did not particularly like him, even after he married Francis Stephen’s sister. And it was obvious that the French were not to be trusted. they really had no justification for war. France herself was busy supporting the Elector of Bavaria, and it was Fleury’s contention that by winning the Imperial election, all things would be added unto the Bourbon cause. Prussia: centralized, authoritarian, agrarian, and always seeking to expand. Habsburg Lombardy was the logical victim, but Charles Emmanuel had to be careful. Most North Italians did not like centralized, authoritarian, agrarian states telling them how to think. Furthermore, joining the anti-Habsburg bandwagon might result in the Austrians becoming too weak to counterbalance his other enemy, the Bourbons. The King chose to wait and see. As the year of 1741 progressed, Cardinal Fleury’s policies underwent a shift. His man in Germany, with whom he was ironically at odds most of the time, was the Maréchal de Belle-Isle. Belle-Isle, seeing the rapid conquest of Silesia by Prussia, advocated a return to the more aggressive methods of Louis XIV and the overt creation of a series of buffer states in Germany, and in Italy, to hem the Habsburgs in. Fleury agreed to send French troops to act as “auxiliaries” of Bavaria (saving France from the opprobrium of actually declaring war on anyone). Spain, actively preparing for war, pressed repeatedly for free passage through southern France in order to invade Habsburg Italy. The French finally agreed, provisional to Piedmont being brought on board. It was assumed that the King of Sardinia would understand where his true interests lay. Austria would grant little and ask much, and even if he could form an alliance with Maria Theresa, the Habsburgs had their plate full north of the Alps. Unfortunately the sand in the King of Sardinia’s glass was running out. On the plus side, he held the all-important Alpine passes and the last of their fortifications was nearly complete. Also, he had made certain he had a friend in the British, who had the eccentric habit of championing smaller states, in order to keep the powerful in check. An alliance with the Bourbons was ruled out. But for safety’s sake, he had better make the appropriate gestures. In that way, he could also blackmail the Austrians into providing some support – with the British as intermediaries, perhaps a lot of support. only too happy to oblige, if France also got involved in the theatre, which of course, they had already stated they were not prepared to do. D’Ormea then contacted the Austrians and informed them that Piedmont might be forced into an alliance against the Habsburgs if his king were not backed up by Austrian troops. Austria proposed a vague alliance without any conditions, then, when French soldiers were seen in the field with the Bavarians, offered some paltry concessions and the Genoese port of Finale (a former Imperial zone which was no longer theirs to give). Austria was advised to seek the aid of the larger powers, and to cut a deal with Prussia; Piedmont would be happy to join in a grand coalition against the Bourbons, who were otherwise too powerful. This was all just the usual diplomatic wind. But a provisional military convention was hammered out, allowing Piedmont to come to Austria’s aid if Lombardy were invaded. And the Alpine passes remained closed by virtue of Piedmont’s “strict neutrality”. Elisabeth Farnese was impatient. She had no desire to grant concessions to the King of Sardinia, who in her opinion had nothing to offer. And Cardinal Fleury was an old woman. 40,000 men were already assembled in Catalonia ready to begin the “reconquista”. Both Spain’s leading military man, the Duca de Montemar, and her own helmsman, José del Campillo, Secretary for Finance, War, the Navy, and The Indies (how’s that for centralization) believed the time to strike was now. Fortunately for Spain, the British were behaving with more than their usual muddle-headedness. The Royal Navy was twice the size of the Spanish Fleet, but instead of bottling up potential enemies in port, they pursued a policy of commerce raiding and amphibious descents on Spain’s Caribbean possessions. Blockade duty did not bring in much prize money. The abject failure of the last of these enterprises, the assault on Cartagena in April 1741, sent shockwaves throughout Europe. Britain feared for her Indies plantations and the largely civilian run Admiralty Board refused to augment the Mediterranean Squadron, at this time commanded by Admiral Haddock. A competent man, Haddock was given a set of tasks that would have boggled a master strategist. He was required to watch all the Spanish ports, and the French at Toulon, and protect Minorca, and see to the security of any British traders, and to prevent any Spanish squadron from reaching the West Indies. To fulfil his mission, Haddock had exactly 12 ships. under Admiral de Court; Haddock felt that an attack by him might be seen as an attack on France, which would be exceeding his instructions sufficiently to ensure a court-martial. Two Spanish convoys got through safely but the third (and last) was thwarted. with the French in Toulon. In any case, two round-trips across the Ligurian Sea had proved rather wearing on their merchantmen. All the same, the Spanish now had 13,600 men at Orbitello (under the Duca de Montemar) and a further 11,700 (under the Marqués de Castelar) at La Spezia, in supposedly neutral Genoa. They were short on horses and artillery, but the Neapolitans would provide these. The latter, 10-12,000 strong (but as it turned out, with little artillery), led by the Duce di Castropignano, were already waiting at Spoleto, in the also-neutral but pro-Bourbon Papal States. The last trick was to march across the Grand Duchy of Tuscany, the ruler of which they were at war with, without violating its neutrality and annoying the French. Here they were helped by Großherzog Francis Stephen himself – Maria Theresa’s husband – who authorized free passage to the Spanish so they could fight his wife’s army on the Po, and not in his duchy. to cross the mountains further south. 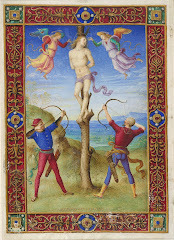 sent to Bavaria; they were doing good work there, but Lombardy was nearly defenceless). The place to meet the Bourbons was the neutral Duchy of Modena, wedged in between the Papal States and Habsburg Lombardy. An invading army could advance from here via either bank of the Po and still retain a good line of communications. Conversely, if a defender occupied the duchy and blocked the crossings of the Panaro River on the south bank of the Po, no advance on either bank was practicable. This is fascinating stuff, and not something that had occurred to me before reading this particular post. Thank you! Hi, I'd love a copy of the PDF. 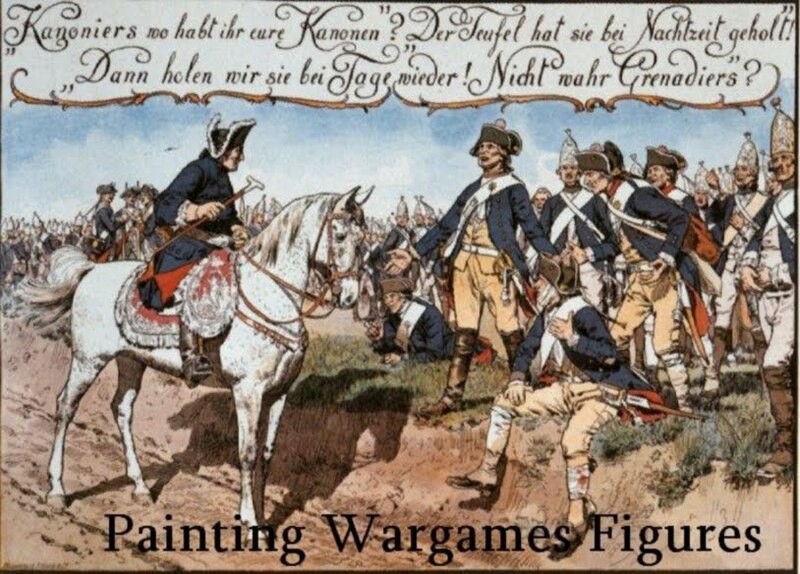 I'm starting to put together my own Neapolitan army and a few of us on the Military Gentleman forum are developing a guide to units, uniforms, flags, etc. This would be a great help as background reading.